Spanish: �Qué es la teoría del color? 1 Life without color would be dull, drab, and boring. A famous man once said that thoughtful people must love color a lot. He was right because some very thoughtful people had some amazing ideas about color. 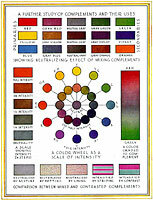 2 This collection of colorful ideas became known as color theory. 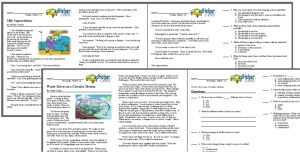 Color theory explains many aspects of color and how colors are created. Just think of how many kinds of red you see. You eat crispy, fire-engine red apples. You dump blobs of deep red ketchup on your French fries. You feel happy to see rosy red sunsets. These many shades of color make opening up a new box of crayons exciting. Color theory will make you look at everything from apples to crayons in a whole new way. 3 Strange as it may seem, a famous scientist affected your crayon box. In 1706, Sir Isaac Newton studied what happened when a beam of sunlight went through a prism. He found out that white light is made up of many colors. The light breaks into a rainbow as it passes through the prism. This was an amazing discovery. Newton then put the colors he saw on a "hue circle" that later became the artists' color wheel. Hue is just another word for color. Feedback on What Is Color Theory?